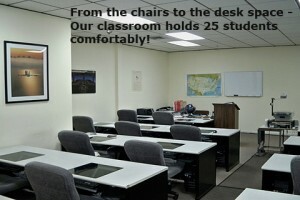 Sheffield School’s main campus consists of over 3,300 square feet of office and classroom space located in Plantation, Florida, which is adjacent to Fort Lauderdale. Located within walking distance (5-20 minutes) of many student housing options, Sheffield’s centrally located training facility offers students easy access to shopping centers, malls, libraries, restaurants, and Fort Lauderdale’s famous beaches. A general view of the lovely city of Plantation. Once you arrive, we’ll provide you with maps and flyers which will help you find your way around the area. 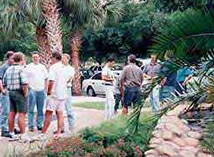 If you’d like more information, feel free to browse the Plantation web site. 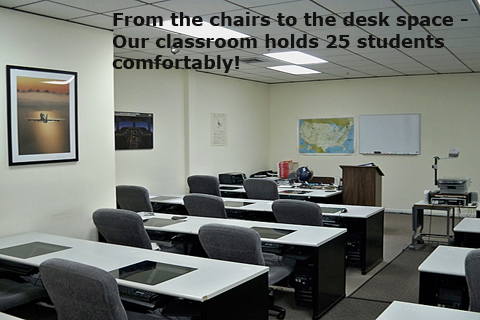 Sheffield’s primary classroom, equipped with modern teaching aids, offer students a comfortable environment in which to learn. Five weeks (or less) of intense, comprehensive training at Sheffield School will prepare these students for one of the most challenging, rewarding, and high paying careers in the airline industry–The Aircraft Dispatcher. 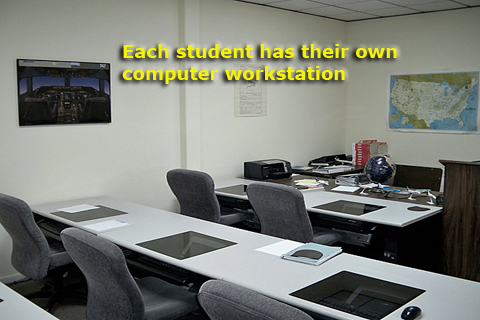 Pictured here is Workstation #26 (Yes, there are 25 others – one for each student!). This particular station has the computer fixed on the lower left, the keyboard tray which is pulled out, and moved up or down. 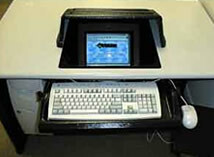 The mouse tray slides sideways and rotates to the student’s desired position. 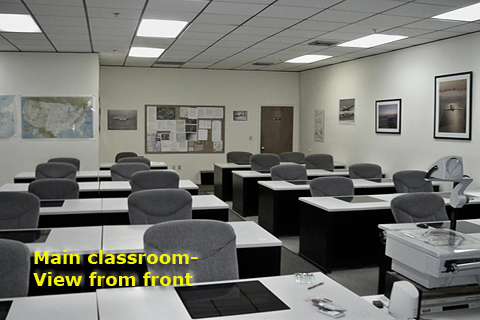 The monitor is under glass and is angled for a perfect direct view and does not obstruct the student’s visibility to the front or sides of the classroom. 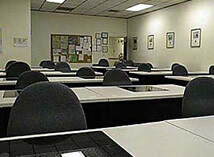 The glare shield is optional and will be set aside during note-taking and writing. 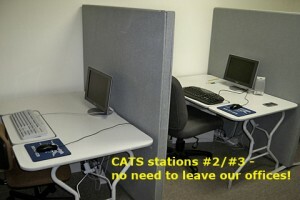 With the exception of the computer location (right or left), all workstations are identical. 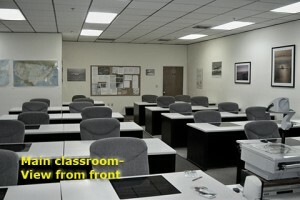 Pictured here is a view from the front of the large classroom. Every student can check their e-mail or set up a new e-mail account, browse the web using our new high-speed T1 Internet access, utilize their own word processor for résumés, cover letters, personal letters, etc. Sheffield School’s multi-terminal computer lab features the latest in aviation computer technology to train tomorrow’s Aircraft Dispatchers. As a student at Sheffield School, you will also access the Jeppesen Access Software system to request flight plans, aviation weather charts, reports, and forecasts. You will also be exposed to the Navtech and Universal Weather computer flight planning systems. Sheffield Students learning Computerized Aviation Weather & Flight Planning in the former Sheffield Computer Lab. Students currently access all flight plans and weather directly from their personal computer work station. 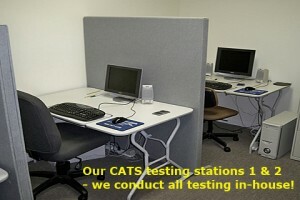 As a student at Sheffield School, you will take your FAA Aircraft Dispatcher Knowledge Test on our “CATS” Computerized Testing System. The testing room is adjacent to the classroom – no need to go off campus or walk to another section of the building. Your results are available immediately. Sheffield provides this service to its students at no additional cost. 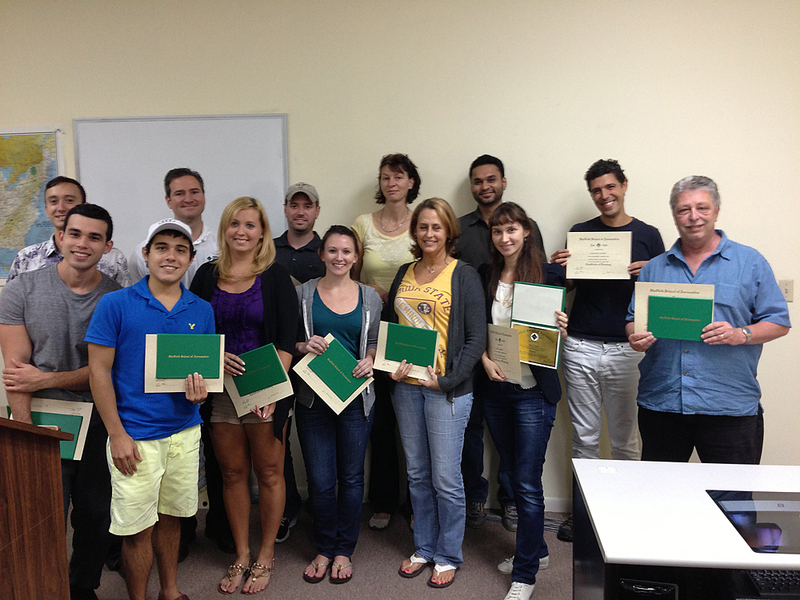 Our graduating Sept. 2013 5-week Class! A recent Sheffield School graduating class after receiving their School diploma and certificate! Sheffield Graduates are considered the most highly qualified, most highly trained, and most likely to succeed in the industry after graduation….no wonder they’re smiling! Students can enjoy South Florida’s warmth and sunshine during break time and lunch. Situated in a relaxing combination of water falls and lush tropical vegetation, benches and picnic tables offer a welcome retreat right outside Sheffield’s classrooms.